To understand the meaning of a particular flower in a dream, we can look at both its physical characteristics as well as its symbolic meanings. Even though few of us will be consciously aware of how flowers have been used as a specific form of communication, it is not beyond the realms of possibility that we have either absorbed such knowledge unconsciously through subliminal exposure (such as reading literature, poetry, observing art etc.) or that on a deeper level we still retain or have access to the shared memories of those who have gone before us through inherited memory or tapping into the Collective Unconscious. Though a pretty but seemingly humble little flower, the symbolic meaning of the pansy is a fascinating one. 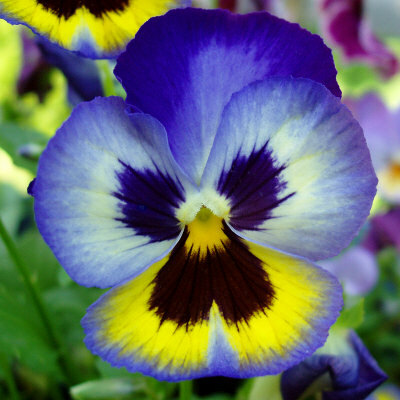 The name “pansy” is derived from the French word pensée, “thought”, and was adopted as symbol of “Freethought” by the “Freethinkers,” being those who sought a mode of thought that was free from societal constraints, expectations, emotions or religious dogma), with the American Secular Union using it symbolically in the late 1800’s. Humanists also use it extensively, as does the Freedom From Religion Foundation (FFRF). In Shakespeare’s Hamlet, Ophelia states “”There’s pansies, that’s for thoughts.” Pansies are thought to resemble a human face, and their nodding habit reminiscent also of a person in deep thought. To dream of pansies then, may be an indication of a new philosophical period of your life, of beginning to contemplate deeper mysteries or of opening your mind to a new perspective. Pansies may appear in dreams as you start to explore your inner life, or when taking time to reflect is pertinent. Along with the association to thought, pansies have also been used as symbols of love and affection. In Victorian England, pansies were used for secret courting, being hidden amongst herbs of a “tussie mussie” to express the giver’s sense of being amorous towards the receiver, or at least, that they held special thoughts for them (here we see the joining of the symbolic “thought” with the more romantic role the flower also plays.) Pansies were a popular flower in Romantic poetry, and in A Midsummer night’s dream Shakespeare writes “juice of the heartsease” (another name for pansy) is a love potion and “on sleeping eyelids laid, will make a man or woman madly dote upon the next live creature that it sees.” The celts and Ancient Greeks also used pansy in a love potion. To dream of a pansy then can indicate that thoughts of love and affection are playing a significant role. If we consider the nature of thought, love and remembrance, the meaning of a pansy flower in a dream can indicate many aspects of a relationship, of healing and reflection, of loss of love or pining for it, of the easing of pain of separated lovers, but also of the simple joy of affection. Pansies in dreams also ask us to consider how thoughts are associated with love, and love with thoughts. Is to think to love? On another level, “pansies” are also a reference, often in a derogatory sense, to homosexuality. If sexual preference, or those of someone close to you are an issue in your waking life, and pansies appear in your dream, you may wish to examine your preconceptions. Are you being judgemental, or should you take time to reflect on the ideas you hold, and the true nature of love? While pansies are also symbols of remembrance, so in a dream can appear when dealing with grief or acceptance of loss, or of honouring a life that has passed, they may also be seen as symbols of merriment, appearing in dreams to show the joy in the simple things in life.